DUBAI, United Arab Emirates - While many believe a more transparent Iran will reduce tensions in the Middle East, CBS News correspondent Charlie D'Agata says some of the nations within reaching distance of the Islamic Republic don't buy that the nuclear deal reached Tuesday will stop Iran from building an atomic bomb, and they worry and the country's massive financial windfall could tip a delicate power balance. The most pointed international criticism of the deal came, expectedly, from Iran's arch enemy Israel, where Prime Minister Benjamin Netanyahu panned the agreement as a "stunning historic mistake," and vowed the Jewish state would defend itself against a nation it considers an existential threat. D'Agata reports that, in a clear effort to reassure allies in the region, President Obama is sending Defense Secretary Ash Carter to the Middle East next week. The only stop disclosed so far will be Israel, where he will have his work cut out for him. But while the Israeli's may have voiced the most vehement opposition, the nuclear deal was met with a profound wariness also in the Arab world, where concerns are widespread that the easing of its international isolation could tip the already bloody contest for power in the region toward Shiite-led Tehran. Arab countries have deep fears of Iran gaining a nuclear weapon, and some have been skeptical that a deal will prevent that from happening. But equally high for key Sunni-dominated Gulf allies of the United States is the worry that a deal gives Iran the means - through an economic windfall -- and an implicit green light to push influence in the region. The Arab world has been polarized for years in a worsening proxy conflict between Iran and Gulf powers, particularly Saudi Arabia, fueling Sunni-Shiite tensions and stoking wars. In Syria, Iran's support has ensured the survival of President Bashar Assad against Sunni rebels backed by Gulf nations in a devastating civil war, now in its fifth year. Yemen has been torn apart this year as Saudi Arabia, leading a coalition air campaign, has tried to help fend off Shiite rebels supported by Tehran. In Iraq, Saudi Arabia has opposed the growing power of Iran even since the 2003 ouster of Saddam Hussein and the rise of a government led by Shiite politicians close to Iran. "Deal or no deal, tension in the region is not going to go away," said Abdulkhaleq Abdullah, a professor of political science at United Arab Emirates University. "If Iran is bent on acting as a hegemon, as a regional power, I think we are in for some difficult times." But Iran's Foreign Minister Mohammad Javad Zarif said in an interview with CBS News on Tuesday, after the deal was struck, that he hoped it would force the U.S. and its allies to scrutinize the forces behind the Middle East conflicts more carefully. "It is important for the people in the U.S. to look at the realities in the region," Zarif told CBS News correspondent Margaret Brennan. "See who is supporting these very serious threats to our regional security and stability and who is defending the region against the threat of extremism, violence and sectarianism, and then they will see." Saudi Arabia issued a pointed warning, saying Iran must use any economic gains from the lifting of sanctions to improve the lives of Iranians, "rather than using them to cause turmoil in the region, a matter that will meet a decisive reaction from the nations of the region," in a statement carried on the state news agency late Tuesday. Other Gulf monarchies sought to show some cautious optimism. The president of the United Arab Emirates, which has longstanding trade ties to Iran, and the emir of Kuwait, who visited Tehran last year in an effort to improve relations, each sent congratulations to Iran and expressed hope the agreement will contribute to regional security and stability. On the nuclear issue itself, Arab countries have shown skepticism that a deal would stop Iran from building a weapon. In its statement Tuesday, Saudi Arabia withheld judgment on the final accord, but underlined it always wanted an agreement that guarantees Iran cannot develop a bomb, includes a strict inspection mechanism for all sites - including military ones - and ensures a swift re-imposition of sanctions if Tehran violates the deal. Saudi Arabia's former intelligence chief, Prince Turki al-Faisal, warned earlier this year that a deal might fuel a regional arms race. Egypt's Foreign Ministry spokesman, Badr Abdelattie, said his country hopes the deal would be "a step toward a region free of nuclear weapons"- a project Egypt has been lobbying for in the United Nations for long, with its eyes on Israel's all but confirmed arsenal. But foremost on the minds of Iran's opponents in the region was the worry that the deal strengthens its hand in the region's conflicts. "This agreement, from our point of view, represents an indirect threat to Gulf and Arab interests and peace," said Tariq Al-Shammari, a Saudi analyst and president of the Council of Gulf International Relations. Behind the scenes, he said, Gulf Arab countries will work to try and keep Iran isolated politically and economically, he added, pointing out that Saudi Arabia in particular has already moved to improve ties with Russia, which is a strong ally of Iran. Syrian rebels were alarmed, warning that now Iran will feel free to infuse even more cash and weapons to prop up Assad's overstretched army. "This agreement translates into more barrel bombs, more massacres and more blood across Syria," said a rebel with the Islamic al-Jabha al-Shamiya faction in northern Syria who spoke on condition he be identified by his nom de guerre of Abu Yasser, for his own safety. Barrel bombs are the crude but destructive bombs dropped from Syrian military aircraft that have caused considerable civilian casualties. He said an Iran at peace with the international community will feel "even more at ease" to implement its agenda across the region, including in Iraq, Syria and Yemen. On the pro-government side in Syria, some had the same expectation. 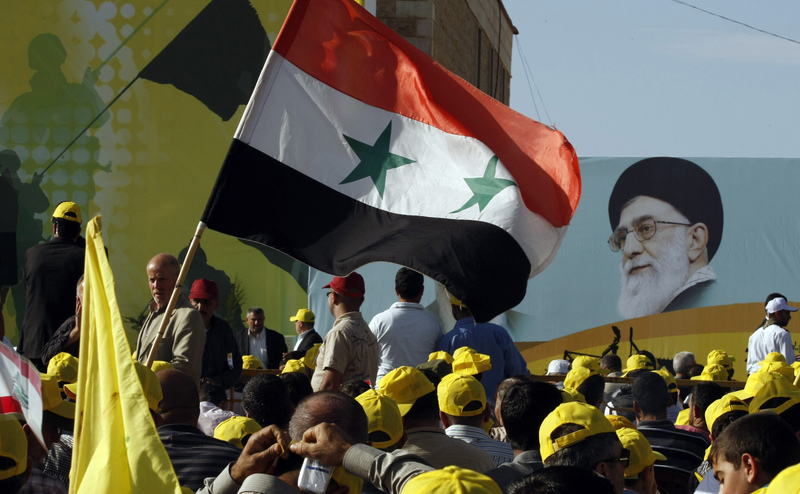 Bassam Mahfouz, a 54-year-old resident of the capital, Damascus, said he hoped Iran will now increase its support for Syria in the fight against "terrorism. Assad was quick to congratulate Iran's Supreme Leader Ali Khamenei and President Hassan Rouhani. In his cable addressed to Khamenei, Assad described the deal as "a great victory" achieved by Iran and a "historic turning point" in the history of Iran, the region and the world. "We are quite assured that the Islamic Republic of Iran will continue, with greater momentum, supporting the just issues of nations," he said. President Barack Obama acknowledged Tuesday that the U.S. and Iran remain at odds over many issues, including Tehran's support for terrorism in the Middle East and its detention of several American citizens. Still, he suggested a breakthrough on the nuclear issue could pave the way for a broader shift in relations between the U.S. and Iran. "This deal offers an opportunity to move in a new direction," Obama said. "We should seize it." Supporters of the deal see that opening as an opportunity to try to moderate Iran's role in the region. In Iraq, the complex sectarian fault lines make the deal's impact hard to read. The Iran-U.S. and Iran-Saudi rivalries have fueled tensions in the country for years. At the same time, Iran and the U.S. have recently found themselves on the same side fighting against the Islamic State group, though they have avoided working with each other. Saad al-Hadithi, the spokesman for Iraq's Shiite prime minister, Haider al-Abadi, called the deal "a catalyst for regional stability" that will lead to better unity in the fight against terrorism. Hamid al-Mutlaq, an Iraqi Sunni lawmaker, was more cautious. "We hope now to see a positive Iranian interference, not a negative one in the region, and to change the way it sees and deals with people of the regional countries," he said. But Sunni hard-liners in the Arab world were convinced the deal signals U.S. acquiescence to the spread of Iranian power. One prominent Saudi Muslim cleric, Salman al-Ouda, who is often critical of the Saudi government, warned in a tweet that "Iran is moving according to a well-studied clear vision, absorbing its adversaries. Where are the Arab governments? Where is their alternative project to face the challenge?" A hard-line Qatari cleric, Mohammed al-Shinqiti, tweeted that in return for limiting Iran's nuclear program, "America has something to offer Iran: An Arab world open for its wars."